1" Series STO-MNI position "R"
Valve bodies designed to ANSI (American National Standards Institute) standards. ISO (International Standards Organization) standards also available. Various application requirements met with manual reset or automatic reset motorized operators. Minimize line pressure drops with straight-through flow swinging gate or rising stem (guillotine action) valve bodies. 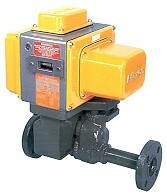 VARCOfor all your Maxon valve needs. Please feel free to contact us with any questions about our products.